For veteran gamers of a certain age, Battletech Technical Readout 3025 is an iconic book of late-80s and early-90s gaming. One glimpse of the Marauder-nee-Zentraedi on the cover is enough to send thrills up the leg of a pair of sweatpants and moisten up some dice. 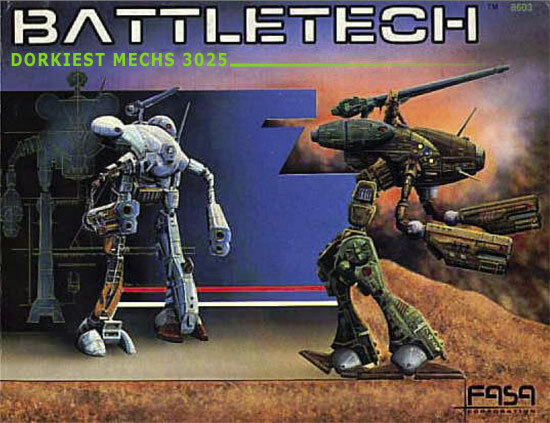 Technical Readout 3025 compiled dozens of now-classic FASA mech designs, many of them stolen from Robotech, and presented each mech with detailed statistics and history about its exploits. Among the many classic designs like the Shadowhawk, Battlemaster, and Atlas are a lot of silly or forgotten designs. With our nostalgia glasses set on the night table of cynicism it turns out most of the designs are silly. Naturally, we're celebrating only the dorkiest. Zack: Remember when FASA was a company that made games instead of a company that "leveraged" its "properties" into "bankruptcy?" Steve: I don't know what any of that meant but it seems sarcastic. I do remember I had some Battletech box with these plastic figurines that Keith and Jamie melted using one of those creme brulee torches. Zack: Plastic figurines? Real men played Battletech with the foldable cardboard mechs that came with the original box. Steve: I played Battletech at Dave & Busters one time but I couldn't figure out how to shoot any of my guns so I just kept running into people. Steve: I have the opposite problem with babes. Steve: Fat guy in a diaper. Zack: Not just any fat guy, Steve. That's General Ambrose SRMsides and he's wearing his steppin' out shoes. Steve: I wish I made robot shoes. I bet that's a sweet job. You've gotta plan out the robot shoes, add some circles and vents, and then you build the robot feet to go in the shoes. Zack: "Mitch, Andy, I've got this plan for a new mech, fellas. We're gonna base it off this baby I saw walking around. Think baby plus missiles." Steve: If I think baby plus missiles I think of a comedy where The Rock or Vin Diesel has to take care of a baby but it gets into all sorts of trouble and at the climax there are some terrorists and the baby is just wandering around causing trouble, but it turns out the baby saves the day and stops the missile. Zack: How does a baby stop a terrorist missile? Steve: What do I look like a big shot Hollywood movie writer? I don't know, maybe it drops its pacifier into the missile gears and it jams up the missile. Zack: Now you're just copying and pasting from the imdb for Escape to Witch Mountain.